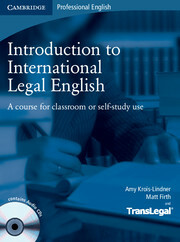 Introduction to International Legal English is an intermediate level course for law students or newly-qualified lawyers who need to use English in their legal work or studies. Suitable for classroom use or self-study, the course prepares learners for using English in a commercial law environment. Using authentic legal texts and case studies supplied by TransLegal®, Europe's leading firm of lawyer-linguists, the course develops an understanding of the law and consolidates language skills. Featuring both academic and professional contexts, Introduction to International Legal English is an ideal starting point for preparing for the Cambridge ILEC examination. An author team comprising lawyers from the US, Britain and Canada and ELT specialists means teachers and students can rely on the course's authenticity and relevance. The use of authentic legal texts and case studies helps learners to develop their understanding of the law while consolidating their language skills. 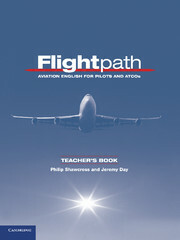 Language focus sections at the end of each unit provide more in-depth language practice.